We are all in the midst of the repotting season and it seems to take quite a toll on our personal and social time as we descend into a furious frenzy of cutting, sifting, chop-sticking, and mossing. 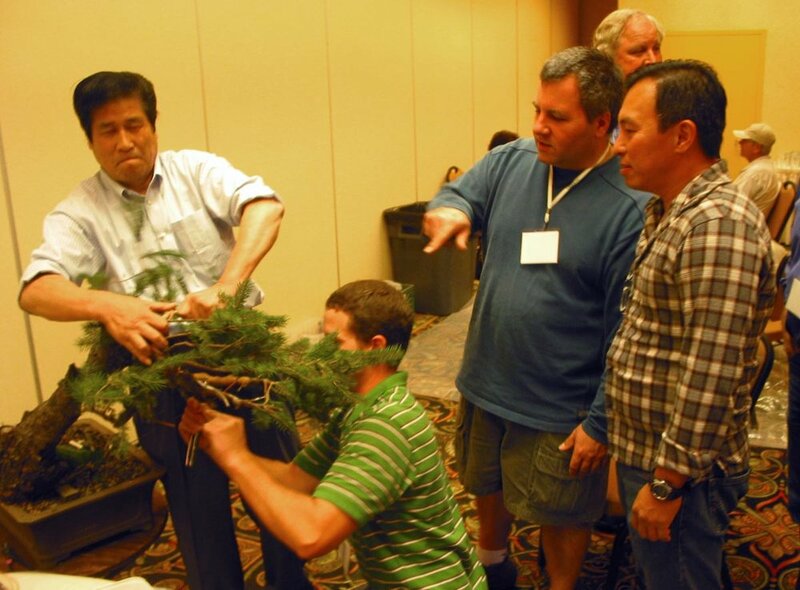 However, it also happens to be the best time of year to work on many trees that haven’t been repotted. Such is the case for many of our conifers that are just starting to wake up. It is sort of a lull between deciduous and conifers for me. The weather has really wreaked havoc in the system, both my schedule and that of the trees. We are all a bit confused. Things seem to be settling down and on their way to a splendid spring. The push right now is to get my conifers pruned, if they were not last fall, so that all of the energy can be maximized and focused in the areas desired. This process also balances out the strength of the tree. One tree that I worked on recently is a largish Engelmann Spruce. Many of you are familiar with this tree. 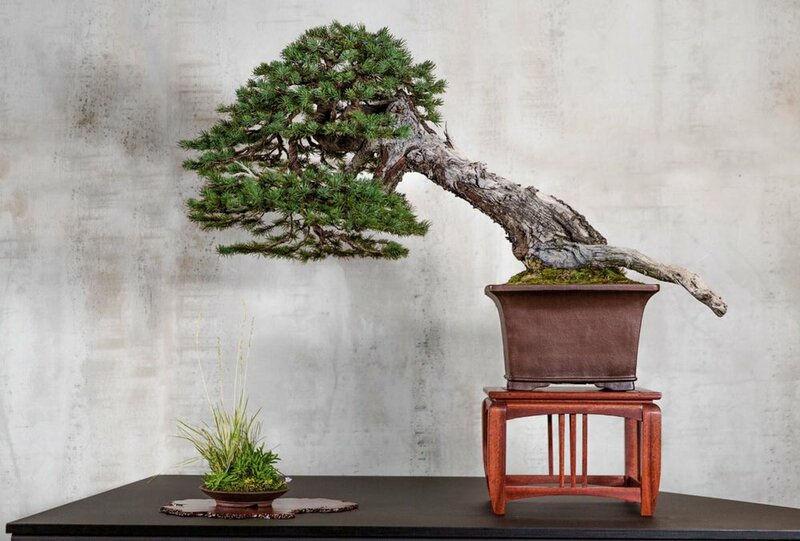 It has been seen at our shows once or twice as well as being shown at the Artisan’s Cup in 2015, National Show in New York in 2016, and the Natives Exhibit at the Pacific Bonsai Museum in 2017. Yep, that tree. It sure has been well travelled. 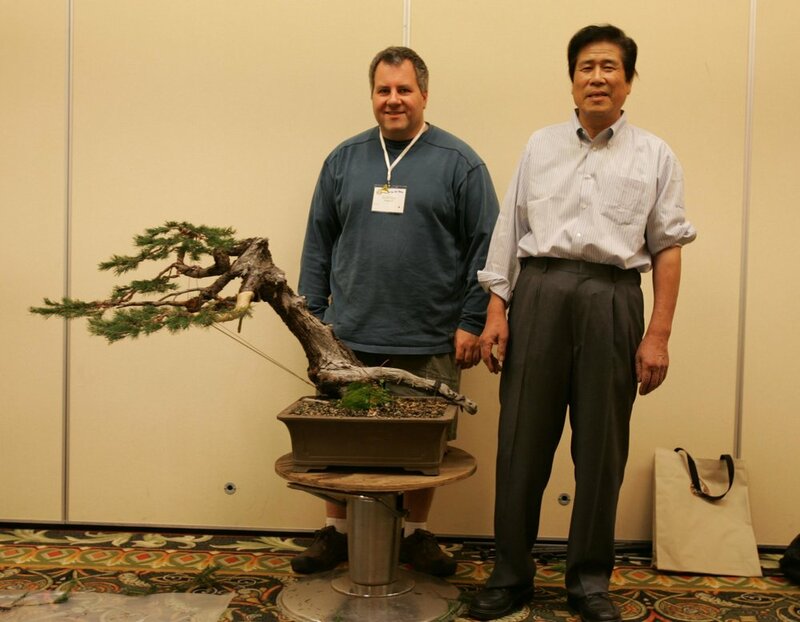 It is also the tree that I, or we, styled together about a dozen years ago, when Boon got me into a Golden State workshop with none other Masahiko Kimura, and his young Jedi apprentice, Ryan Neil (Note the essential shell necklace –vintage Neil). What a fortuitous meeting, with my two teachers and Mr. Kimura. But since this tree spent most of last year up in Federal Way at the Natives exhibit, it was time to take stock and prune out any dead tips, cut back where I could and generally reacquaint myself with the tree. Mr. Kimura, Ryan, Myself, Boon. When I exhibited the tree at the Artisan’s Cup, it was a last-minute replacement for a tree that dropped out at the last minute from California. As such, it was some really late nights getting it ready for the show. It was already somewhat wired and cutting in. So I reworked the tree and told myself that most of the wire could stay, though I cut out much of the heavier wire for aesthetic reasons and everything held pretty well. But then it was on to New York the next year, with a partial de-wiring, and adding back some detail wire. I worked on it a whole day with Ryan to get the first branch just right as a model to follow and learned much. I finished the tree myself, but I was dissatisfied with the results. There was this sort of gnawing discomfort that it just wasn’t giving the impression that I wanted. However, I was still very proud of the achievement because it was very full and much more developed than most collected spruces. Maybe too much so. The crown was almost a solid helmet of foliage with not quite enough separation between elements. It has fabulous dead wood, but the foliage was rather boring. Still wondering what the future of the tree was, I sent it to New York and back, and then to Pacific for the 2017 season. Fast forward to our current pruning session. As I began looking for back buds to prune back too, I realized there weren’t many. Much fewer than I expected. I think this was partly due to the reduced amount of light at the Museum and less fertilizer during the season (per my instruction, at the time). But as I began to look at the branches, I think there was another big contributing factor. And that is, overcrowding. There were just too many branches to support. The tree grows like a juggernaut, but all of that energy was being dissipated into more and more branches. This is a very good problem to have. It took a good dozen years to get here, but now I realize that it was time to reassess and start thinning things out. While pruning this tree I was very committed to the rule of two. Only allow two branches at any intersection. It could be the trunk and a branch, two larger or two smaller branches, or a large and small combination. But two is going to be it and I was going to be ruthless about it. It was then that I discovered that I had junctures of three and four branches all over the tree. In my desire to maximize the foliage mass for consecutive shows I had inadvertently sacrificed the structural quality of the tree. I was so focused on the creation of nice foliage pads that I didn’t fully reexamine the tree each time I touched it. It is very common to leave three shoots on the end of branch for fullness before a show. But since I had stacked all these shows up in a row, after four years, those shoots turned into ramified branches, which I hadn’t questioned. I also discovered that this was a major factor contributing to wire cutting in at an astronomical rate. Spruce are known for wire marking rapidly and this tree is no exception. The stronger the bend, the more it cuts in. That is very predictable on spruce. 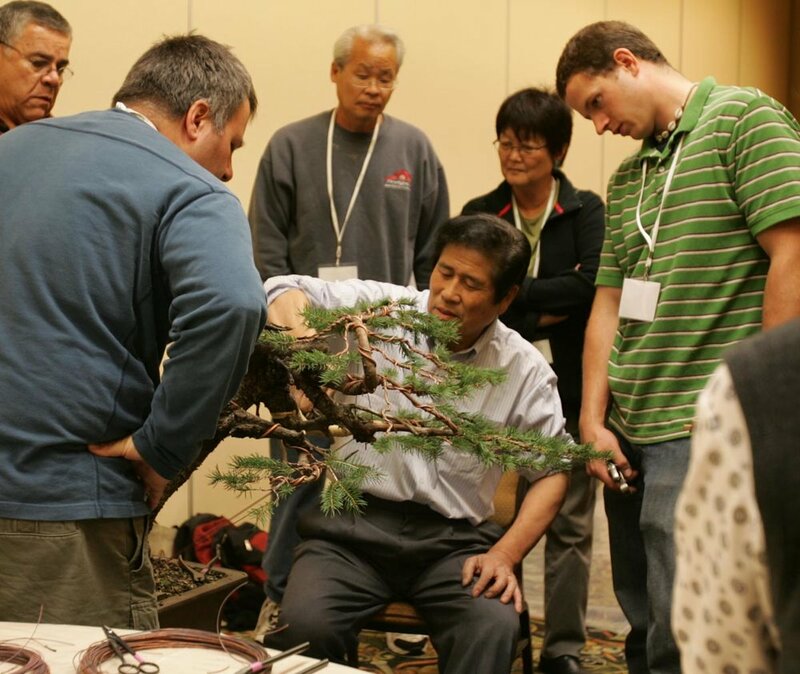 When folks are new to bonsai, they generally fall into two camps. Pruners and Waterers. The Pruners are people who will readily prune their trees down to a stump without blinking an eye. 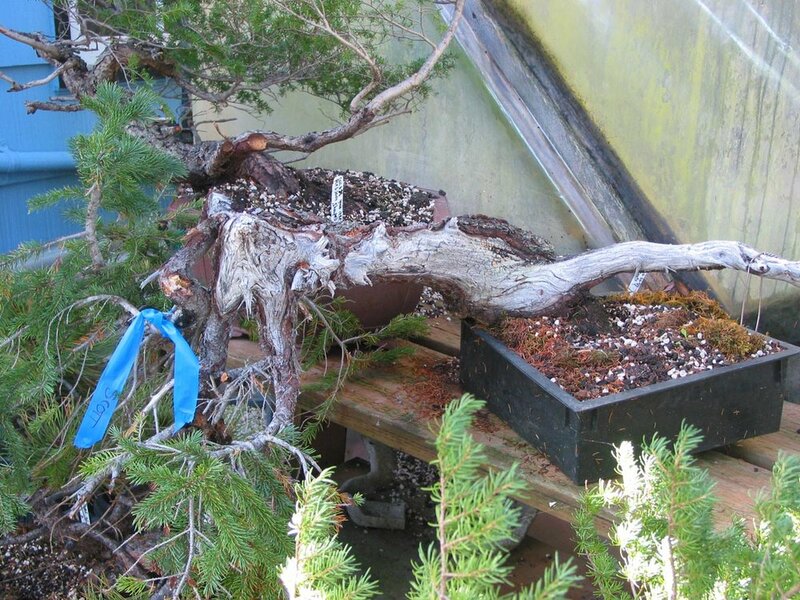 The can leave the tree rather weak and unresponsive until it builds it’s strength back up. Waterers are content to nurture their trees slowly over time. They would prefer to go through a long prayer ritual to the bonsai gods before they are ready to cut off a single shoot. I definitely fell into the former camp and have learned to balance my approach. But this spruce had had enough of nurturing. Now was the time to prune. It was DAMN hard. I spent a lot of time growing those branches. And mostly, they were good branches. I had to weigh many factors. I was not going to keep three, sometimes four, branches at one juncture. So, what to do? Do I keep the two shorter ones? Do I keep a long and short? Do I keep the one on the right or left? So, here is my little hierarchy to make those decisions. One, keep the branches with live buds. This is so hilariously obvious yet is the one I get caught on all the time. If you have elongating species, like the spruce, and you pinched it the previous season, you won’t necessarily have buds on the tips. Plus, there can be insect damage, overall weakness, etc.… So always check to see if there is a bud. Next, do I need the length? Sometimes I do. At other times, I want to compact and keep it short. In that case, I like to keep a long and short branch. It looks more natural and develops more elegantly. Thirdly, where are the adjacent branches growing? By pruning, will I make a hole, which may actually be desirable for some negative space, or is there a better branch available to take its place? In all cases for this spruce, there was always something available nearby. And finally, can I improve the structure of the tree? Can I eliminate flaws like crossing branches? For a show, I may wire things into position to fill a hole that I would never keep long term, or so I thought, four years ago. Now that the job is done, I have a renewed fondness for the tree and vision for the future. It was quite harrowing at first, but now I see a tree once again. Good trees are intimidating, old and large even more so. By pruning, it got older and more tree like, and I now feel as though I can bring it to fulfill the potential it has had all along. The tree looks great and I would have to show you the garbage can full of branches to prove that I pruned anything. Please note how the apex is slowly being moved to the right and that the back branch is finally peeking around the right side. I left all of the wire that was not cutting into branches on the tree to help hold it for this next growing season, but come fall, I am really looking forward to completely de-wiring the tree and restyling it from scratch. I just did not have time now, with preparations under way for our spring show. It is now set up to grow vigorously through this next year and build up strength for a good styling session. There will likely be much more pruning at that time. But at least for now, the strength is balanced and many structural flaws are eliminated. Remember, three’s a crowd.